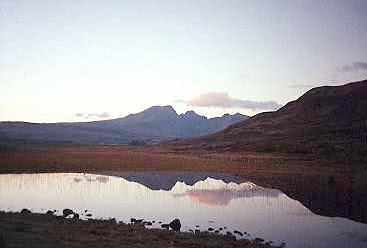 The Loch Cill Chrisosd in Strath, the Isle of Skye, might not be far from the Church of the same name (Christ's Church), unless in those most ancient times the Strathaird Church was located at Ashiag. Whatever, several centuries ago this particular loch was said to harbour evil spirits. When St. Columba visited the island in 570 AD however, he apparently succeeded in exorcising the loch, which could only have boosted his eminence as expert exorcist of Highland lochs. Nevertheless, he may not have entirely succeeded, unless the water-kelpie who continued to haunt the loch came later, when the effects of Columba's spiritual, purging power had worn off. It is said that this particular water-kelpie was as wanton as he was wicked, for he was able to assume the appearance of a handsome young man. In this dashing disguise he caused havoc in the nearby hamlets by seducing young women. He would then carry them off at full gallop on his ghostly grey steed and plunge back into the dark depths of the loch. During one of the water-kelpie's shameless shavies, it's said that he followed a priest taking him to be a young woman. This was perhaps due to the priest's graceful gait, and his long flowing soutane. Protected by his 'calling' from the wickedness of the water-kelpie, when he was eventually accosted by the 'young man', the priest seized upon the occasion to convert him to Christianity. The legend thus classically concludes that ever since then there's no record whatsoever of the converted water-kelpie ever troubling the region again with any wanton wickedness that was once his wont. But without being irreligious, over liberal or leftish, could there not be another, less conventional conclusion? The water-kelpie obviously had very little respect for women. Could one not add an ironic twist to the legend by imagining that during the period of his being converted, the water-kelpie fell in love, not only with Christianity, but also with the priest himself? 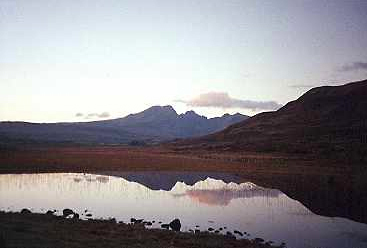 And assuming that this love was almost immediate and reciprocal, and that omnia vincit amor, including the most execrable evil, could one not then conclude that from then on peace and goodwill reigned in the region, simply because within their secret love-loch haven, the priest and the water-kelpie lived happily ever after. ?